Sanfelice (1675-1748) certainly was the most delightful, even whimsical, Neapolitan architect of the 1700s. He might have founded an entire “school” of architecture had not Charles III felt that a great kingdom needed great buildings (somewhat like the totalitarian architecture of the 1930s). Basically, build big —opulent big for my palaces and functional big for the masses (the Albergo dei Poveri, for example.) But make it big. The two architects of Big were Vanvitelli (opulent) and Fuga (functional), but Sanfelice still attracts. Indeed, even though he had the misfortune of being born in a period in which his creative imagination was about to be run over by the architects of the new dynasty, even Charles III recognized his abilities, entrusting to him the design of the splendid royal gardens at the new Capodimonte palace. Sanfelice was also responsible for the construction of the nearby Nunziatella, the military academy in the days of the Bourbons, as well as for the Villa d'Elboeuf, the first in the grand residences now called, collectively, the Vesuvian Villas. His Palazzo Serra di Cassano is west of and behind Piazza Plebiscito on via Monte di Dio, the road leading up to the height of Pizzofalcone (aka Mt. Echia). The building is from the first half of the 1700s and to this day represents the finest in the tradition of Neapolitan urban architecture. The building is vast, originally having entrances on two different streets; the one that used to open onto via Egiziaca facing the Royal Palace was closed many years ago, however, in 1799 when the owner closed it to protest the execution of his son, who had been involved in revolutionary activities of the day; that is, the son had been a supporter of the short-lived Neapolitan Republic. The father said the door would remain closed until the ideals for which his son died were realized. It is still closed. (It was opened briefly in 1999 on the occasion of the 200th anniversary of that revolution.) The dual portals of the entrance on via Monte di Dio open onto twin curved stairways (photo, above) leading up over an octagonal courtyard. The elegance of the decoration, chandeliers, inlaid marble, etc. make the Palazzo Serra di Cassano a paragon of regal Bourbon residences. Today it houses the Italian Institute for Philosophical Studies. 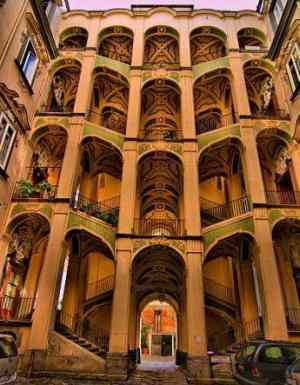 Sanfelice's best-known building in Naples is the Palazzo dello Spagnuolo (lit. "of the Spaniard"). It is in the Vergini section of the city, adjacent to the Sanità, in back of the National Archaeological Museum. The building goes back to 1738 when Marquis Nicola Moscati di Poppano contracted to have two pre-existing buildings rebuilt into a single structure. Published literature on the building says that the original contractors were Francesco Attanasio and and Felice Polito. Sanfelice's name is nowhere to be found. We assume he "helped" because he was building his own family dwelling two blocks away at roughly the same time, and the two buildings are identical in many respects, especially the striking and elegant double flights of stairs, known as a "hawk-winged" staircase. 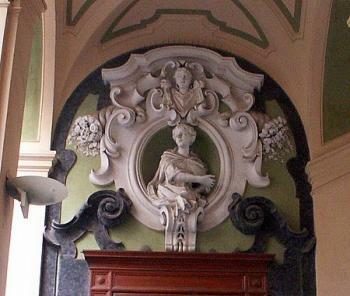 The front courtyard with its lunettes, ornamental panels over the doors on all four stories, and busts framed by volutes and floral elements, all so typical of the Neapolitan Baroque, has been recently restored (photo, below).The stairways are not steep, and the individual steps, themselves, are not high; this was done, believe it or not, to make it easier for horses! Centuries before Elisha Otis made it easy for us, cavaliers just in from a night on the town could trot through the front portal and right up to their nightly repose in the upper stories before having to dismount. The horses were trained to move back down the other staircase and into the stables! The name "dello Spagnuolo" comes from the fact that the building changed hands a number of times; in 1813 it became the property of Spanish nobility and simply acquired the nickname. There followed scandals over the shoddy maintenance of the building in the 19th century. The "Spaniard" was finally declared a national monument in 1925. The most recent restoration looks fine. The building is so choreographic that it has attracted filmmakers for location scenes, most notably in Processo alla città (A City Stands Trial), dir. Luigi Zampa (1953) and Giudizio universale (Judgment Day), dir. Vittorio de Sica (1961). Indeed, Roberto De Simone, the director of the Naples conservatory, once used the courtyard as a back drop for his folk musical, La Gatta Cenerentola [The Cat Cinderella]. The building is now also set to house the Totò Museum, which will showcase the life of Italy's most famous film comic and native of the Vergini quarter. Sanfelice's own home, nearby, is unfortunately, in a total state of disrepair. It seems to me to be identical to the Palazzo Spagnuolo, even down to the double courtyard (seen in the above photo, right, past the stairs) except that in this case, the passage-way is gated off. I have been told that, architecturally, it is in some respects even more interesting than the Palazzo Spagnuolo.